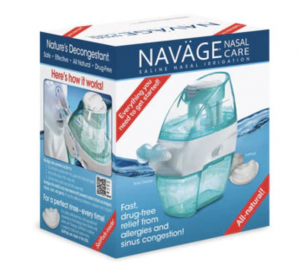 Get the Navage Nasal Care Saline Nasal Irrigation Kit for only $53.99 with promo code 40FORU – it’s normally $89.99! Only Navage has powered suction to help relieve congestion caused by cold and flu, allergies, dry air, sinusitis, dust, ragweed, post nasal drip, environmental pollution, and pregnancy rhinitis. Navage also helps reduce snoring and improve sleep.